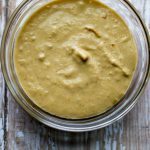 This easy Spicy Peanut Dipping Sauce is the perfect accompaniment to spring rolls, fresh veggies, stir-frys, rice bowls or even as a condiment on your favorite sandwich. It's creamy, nutty and has just a kick of heat. Place 1/4 cup warm water in bottom of a high speed blender. Add the rest of the ingredients. Blend until smooth. Add more warm water, if necessary until you reach your desired consistency. Enjoy!